MUNICH (AP) — President Donald Trump's national security adviser said Saturday there was "incontrovertible" evidence of a Russian plot to disrupt the 2016 U.S. election, a blunt statement that shows how significantly the new criminal charges leveled by an American investigator have upended the political debate over his inquiry. The statement by H.R. McMaster at the Munich Security Conference stood in stark contrast to Trump's oft repeated claim that Russian interference in his election victory was a hoax. 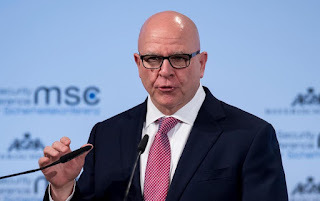 "As you can see with the FBI indictment, the evidence is now really incontrovertible and available in the public domain," McMaster told a Russian delegate to the conference. McMaster also noted that special counsel Robert Mueller's team had shown that the U.S. was becoming "more and more adept at tracing the origins of this espionage and subversion." Just minutes before, Russian Foreign Minister Sergey Lavrov had dismissed the indictment as "just blabber." "I have no response," Lavrov said when asked for comment on the allegations. "You can publish anything, and we see those indictments multiplying, the statements multiplying." But Lavrov did not say what he specifically disputed in the indictment. Trump tweeted late Saturday that McMaster's mention of Russian election meddling forgot to include that the election results were not changed by the Russians efforts. And he said McMaster should have noted the only collusion was between Russia, Democratic nominee Hillary Clinton and the Democrats. Trump frequently has tried to turn the tables on who tried to work closely with Russians. In Russia, news of the indictment was met with more scorn. "There are no official claims, there is no proof for this. That's why they are just children's statements," Andrei Kutskikh, the presidential envoy for international information security, told Russian state news agency RIA Novosti. McMaster also scoffed at the suggestion that the U.S. would work with Russia on cyber security issues. "I'm surprised there are any Russian cyber experts available based on how active most of them have been undermining our democracies in the West," he said to laughter. "So I would just say that we would love to have a cyber dialogue when Russia is sincere." Lavrov argued that U.S. officials, including Vice President Mike Pence, have said no country influenced the U.S. election results. "Until we see the facts, everything else is just blabber. I'm sorry for this not very diplomatic expression," Lavrov said. It outlined the first criminal charges against Russians believed to have secretly worked to influence the U.S. election's outcome. According to the indictment, the Russian organization was funded by Yevgeny Prigozhin, a wealthy St. Petersburg businessman with ties to the Russian government and Russian President Vladimir Putin. Lavrov denounced "this irrational myth about this global Russian threat, traces of which are found everywhere — from Brexit to the Catalan referendum." Russia's former ambassador to the United States, Sergei Kislyak, similarly dismissed the detailed allegations contained in the indictment as "simply fantasies." Kislyak's name has come up in the FBI and congressional investigations of possible collusion between the Trump campaign and Russia. Pressed on the election interference that is alleged to have occurred while he was Russia's envoy to Washington, Kislyak said, "I'm not sure I can trust American law enforcement to be the most precise and truthful source of information about what Russians know." "I have never done anything of this sort, no one in my embassy did," he said during a panel discussion at the Munich conference. "So whatever allegations are being mounted against us are simply fantasies that are being used for political reasons inside the United States in the fight between different sides of the political divide." Trump's former national security adviser, Michael Flynn, pleaded guilty in December to lying to the FBI about his conversations with Kislyak before Trump's inauguration. In Russia, one of the 13 people indicted said the U.S. justice system is unfair. Mikhail Burchik was quoted Saturday by the newspaper Komsomolskaya Pravda as saying that "I am very surprised that, in the opinion of the Washington court, several Russian people interfered in the elections in the United States. I do not know how the Americans came to this decision." Burchik was identified in the indictment as executive director of an organization accused of sowing propaganda on social media to try to interfere with the 2016 election. He was quoted as saying the Amercians "have one-sided justice, and it turns out that you can hang the blame on anyone."